An Ancient Solar System...: The Universe in 101 words: Storms on Titan? Above: Artists impression of raindrops on Titan. By JustV23 on deviantart. The weather where I live in Scotland can be both very cold and very wet, but it has nothing on Titan - the little Moon's sky is filled with orange smog, and it's plains of ice give way to deserts of black hydrocarbon sand. Onto this weird landscape the thousand kilometre long rainclouds storm liquid methane drops. The drops would fall slowly in the low gravity, and would be twice as big terrestrial drops - a Titanian rainstorm would be like a cloud of small, downward drifting, marbles. Although, at over a hundred and sixty degrees below freezing, considerably more dangerous. 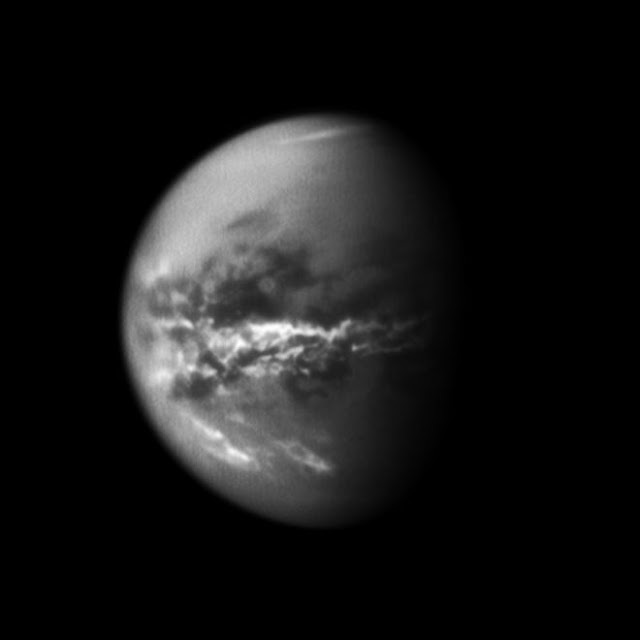 In this infrared view of Titan the white streaks are storm clouds, thousands of kilometres long, which are bringing rain to the moon's vast black desert plains. Courtesy of JPL/ NASA.